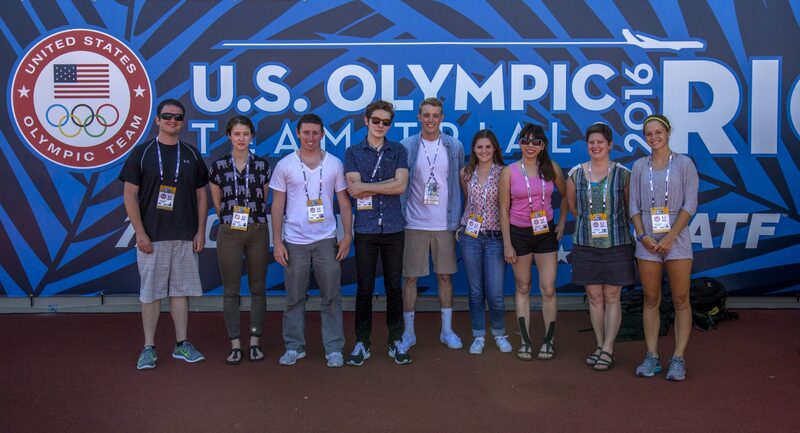 University of Oregon students pose for a team photo during the 2016 U.S. Olympic track and field trials, which they covered as part of a class offered at the School of Journalism and Communication. Photo by Lori Shontz. When I was a full-time sports journalist, I joked about how I’d teach a sports reporting class. I’d take the students to, say, a baseball game. I’d make it rain. And then I’d announce they had to file two stories anyway even though there had been no game. This happened to me as an intern for The Morning Call in Allentown, Pennsylvania. It rained at the velodrome, and instead of getting the night off, as I assumed, I had to chase down world-class cyclists as they were leaving and scramble to think of questions. A terrific learning experience. And by the end of the class, the students are working for professional publications. 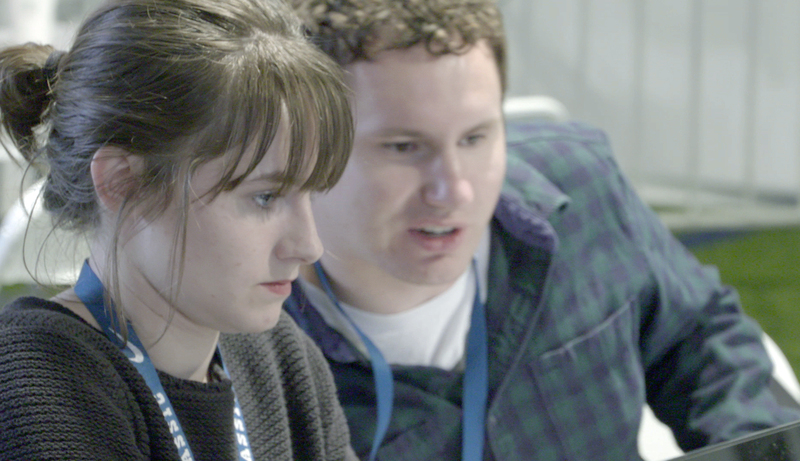 Because of shrinking staffs and budgets, many are happy to work with reliable student freelancers, especially ones who have already been edited on-site. Now I teach at the University of Oregon’s School of Journalism and Communication, and my spring term class — officially “Sports Bureau” but known by all as “track class” — combines classroom instruction with that kind of on-the-job training. My students cover the track and field events at one of the sport’s storied venues, Hayward Field, which is in the heart of our campus. They publish all of their work, either on our class website or for professional publications that need coverage of major events. In the past two years, my students have covered the NCAA championships, U.S. nationals and the U.S. Olympic trials for 33 outlets, ranging from The Arizona Republic to The Tampa Bay Times, from the Santa Cruz Sentinel to the Syracuse Media Group. Twenty-five outlets paid the students. But this is more than a freelance gig. It’s also a rigorous learning experience: The students learn critical thinking skills that will benefit them in any media profession. 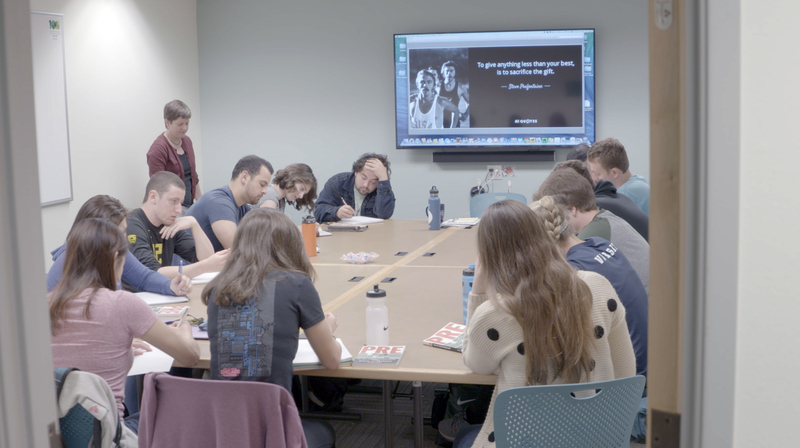 Students in the University of Oregon’s “track class” prepare for covering the sport by reading and reflecting the biography of the late Steve Prefontaine, an icon in the Eugene community. Photo by Charlie Litchfield, University of Oregon. Eugene, Oregon, is Tracktown USA. The sport matters to the city, so students to connect to the whole community. Before they show up at an actual competition, they read history of both the sport and Eugene itself. They attend track social events, where they learn to work the room. The assignment: Introduce yourself to three people. Say you are new to the track beat. Ask them what you should know. I invite coaches to the classroom, and they go deep with the students, who begin to realize how much they don’t know or don’t fully understand. The students aren’t getting quotes for stories. They’re listening to learn. George Walcott, a former Pac-10 sprint champion, demonstrates the technique for starts. Heike McNeil, who has a doctorate in chemistry, details the science of training cycles. Ian Dobson, a 2008 Olympian, breaks down distance-race strategy and explains how low-paid runners make ends meet. Vin Lananna, executive director of Tracktown USA, incoming president of U.S.A. Track and Field and a 2016 Olympic coach, discusses the sport’s challenges — and its potential. The assignment: Write questions before the visit, yes. But also: Write questions afterward to ask in future interviewees, based on what you learned. A coach’s job is to put athletes in better position to succeed, and that’s what I do at competitions. I might ask follow-up questions with a student in the interview area, then discuss how to do it herself the next time. I might critique a lead and ask a student to revise it on the spot. I might help someone keep track of heights to live-tweet the pole vault. The assignment: One, maybe two, stories. Students don’t leave the track until they’ve filed — meaning, they’ve sat side-by-side with me as I ask questions and tweak copy. A bonus: This keeps my professional skills up to date, and that makes me a more effective teacher. Sports journalists don’t have a 9-5 schedule, and track class is on the schedule for Friday night. Three times a term, students spend most of a Saturday at the track. At the Eugene Marathon, they begin reporting at 6 a.m. on a Sunday. Deadlines are real in a way that classroom due dates are not. As I tell students, basketball players practice free throws, but they can’t simulate the pressure of taking those shots with seconds left on the clock. They have to do it. Here, the students do deadlines. A bonus: This drives home that sports journalism isn’t really about the sports. It’s about the journalism. The students are side-by-side with professional journalists. They conduct interviews together. They crowd around the television together to watch replays. They complain together about writing over the roar of the clean-up crew’s leaf blowers. The students learn not just by doing, but also by watching what the pros do. A bonus: Students learn to keep their own financial records. Sports teams break down film, right? We do the same. After every meet, students send me an email detailing what they did well, what they need to do better and what they would like me to focus on the next time I edit with them. That’s metacognition — thinking about thinking — and it’s a crucial but often-overlooked component of learning. This tool is transferable anywhere: football games, the education beat, city council and beyond. University of Oregon students Madison Layton and Jonathan Hawthorne review each other’s stories before filing on deadline at the Prefontaine Classic. Photo by Charlie Litchfield, University of Oregon. Track class gives students experiences they could never get in a classroom. Watching a meet in a downpour. Writing stories in weather so cold we could see our breath. (Pro tip: fingerless gloves.) Being the last ones in the venue and finding an unlocked gate. My favorite moment came on Day Six of the Olympic trials. The post-competition concert stage was next to the media tent, and as a Johnny Cash tribute band rocked out, two students were writing on an East Coast deadline, another was transcribing an interview and two were straining to hear a press conference over the sounds of Folsom Prison Blues. Everyone made deadline. A terrific learning experience. No joke. Lori Shontz teaches reporting and sports media at the University of Oregon, where she also runs Writing Central, a peer coaching center in the School of Journalism and Communication. She moved into the classroom after nearly 25 years in the newsroom, much of it in the sports department. Follow her at @lshontz.